Hubway, Boston’s bike share program, reports there has been a 100 percent increase in riders since 2007. While there are currently 82 miles of bike lanes installed to date, the city plans to install some 360 in the next 20-to-30 years. The point is: Cyclists aren’t going anywhere. By committing to bolstering cycling safety, drivers not only do a service to the community, they help themselves by reducing the chances of a collision, which could result in substantial fines, higher insurance rates and even criminal charges. In the eyes of the law, bicycles are vehicles, and they are to be afforded the same rights and responsibilities as any other vehicle on the road. As a driver, it helps to understand this when trying to navigate the road next to them. Keep in mind: bicycles reduce traffic. Although it might seem like bicycles are slowing down traffic, in reality, one person on a bicycle is one less person in a car, taking up more space on the road. Give cyclists adequate room to pass. When you try to squeeze pass them, you put them at risk of serious injury – which puts you at risk of either a citation or even criminal charges. Don’t make any sudden moves. One of the leading causes of bicycle crashes in Boston is abrupt turns by motor vehicles. Use your turn signals and always do a double take for cyclists first. Look before opening your door. Always check to make sure there are no oncoming cyclists before opening the door of your parked car. This action, called “dooring,” can seriously hurt a cyclist. The law puts the onus for prevention on the person inside the vehicle – not the cyclist. When it comes to bike lanes, recognize the cars have to stay out of it, but cyclists don’t have to stay in it. 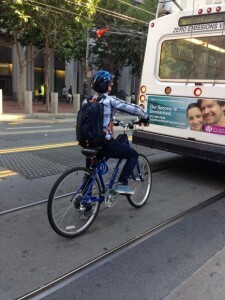 Bicyclists are free to ride in the bike lane – or not. Save the honking, if you can. Besides being often unnecessary and therefore rude, honking can startle a cyclist, resulting in a crash. Only honk if it’s absolutely necessary. Beyond all this, it’s important to, as always, avoid drunk driving and pay attention. A significant number of bicycle-versus-vehicle accidents occur because drivers aren’t paying attention or don’t fully have their wits about them. A requirement for motorists to provide at least 3 feet when passing a bicycle (even if it means crossing the center line). Although Boston is recognized nationally as one of the safest cities for cyclists, we have seen an uptick in crashes resulting in injury and death in recent years. We all must work together in 2016 to reverse this trend. If you are injured in a bicycle accident in Massachusetts, call the Law Offices of Jeffrey S. Glassman for a free and confidential appointment — 1-888-367-2900.